Summer’s here, and it’s time to grill up some effortless meals that take the heat out of the kitchen. Grilled salmon is a delightfully simple way to serve up a superfood dinner full of protein and healthy fats. Grilling imparts an irresistibly smoky, delicious flavor to your salmon filets and kabobs, making this a must for your summer menus. Before heading to the store, there are a few things to consider when purchasing salmon. Wild or farmed, which is better? Farmed salmon are raised in pens and given antibiotics to reduce the spread of disease, and they also contain contaminants from their fish meal diet. Make sure to purchase wild-caught Alaskan salmon, which is less fatty than farmed salmon and comes from a sustainable population. These wild fish have a diverse diet and are able to swim in a relatively clean habitat. Purchase skin-on fillets if possible, since the skin keeps the raw fillets from falling apart on the grill. You’ll want to place the salmon fillets on the hot grill skinless side down first. Sear the raw skinless side, just enough to get some grill marks and cook the edges. Then, carefully flip the fillet and finish cooking at a lower temperature with the skin-side down. If you can’t find salmon with skin on, use a tin foil packet to keep the fish from falling apart on the grill. Salmon is loaded with protein and healthy omega 3 fatty acids, making this nutritious fish worth rotating into your healthy eating recipes at least twice a week. Since your body can’t produce omega 3 fatty acids on its own, salmon is an excellent way to get both DHA and EPA omega 3’s into your system. Regular consumption of salmon is associated with decreased risk of cardiovascular issues, including heart attack, stroke, heart arrhythmia, high blood pressure, and high triglycerides in the blood. Salmon contains high levels of DHA, which is the main structural fatty acid in the central nervous system. Eating salmon on a regular basis improves mood and reduces risk of depression. DHA, one of the omega 3 fatty acids found in salmon, is critical for brain function and a healthy nervous system. 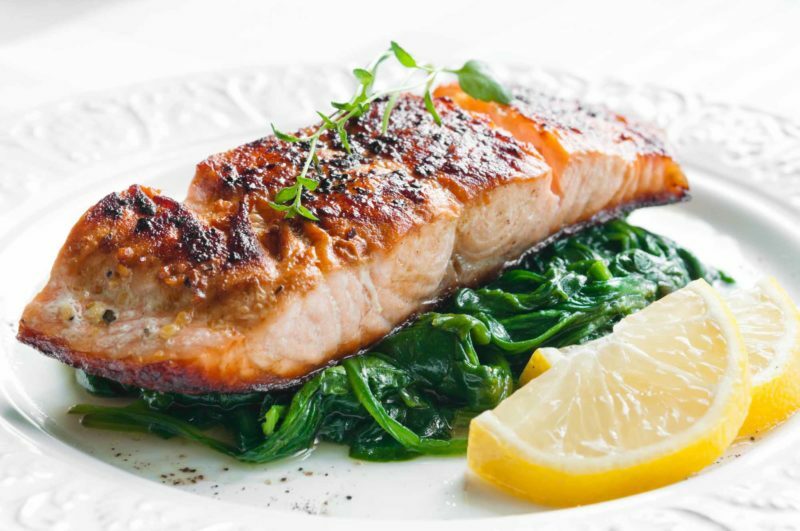 Eating salmon regularly is beneficial in the treatment of osteoarthritis and other inflammatory joint conditions. Salmon contains high amounts of selenium, and this essential element is associated with decreased risk of joint inflammation. Excellent source of vitamin D.
Vitamin D is crucial to maintaining optimal health. Vitamin D deficiency has been linked to an increased risk of cancer, cardiovascular disease, type 1 diabetes, and other serious autoimmune diseases. The omega-3 fatty acids, vitamin D, and selenium in salmon work to manage insulin levels throughout the body, lowering blood sugar levels by facilitating the absorption of sugar in the body. 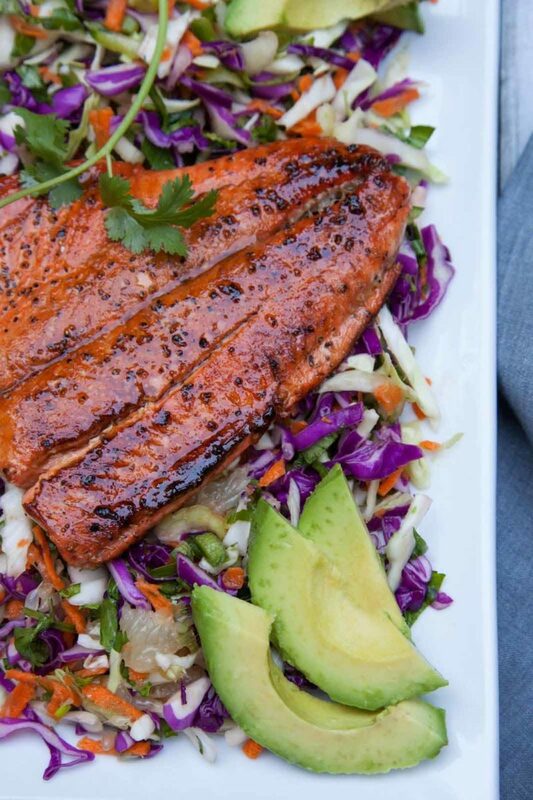 Whether grilling in your backyard or at a picnic, make sure to include protein-rich salmon on your menu. You’ll reap amazing health benefits while enjoying this tasty, versatile fish. 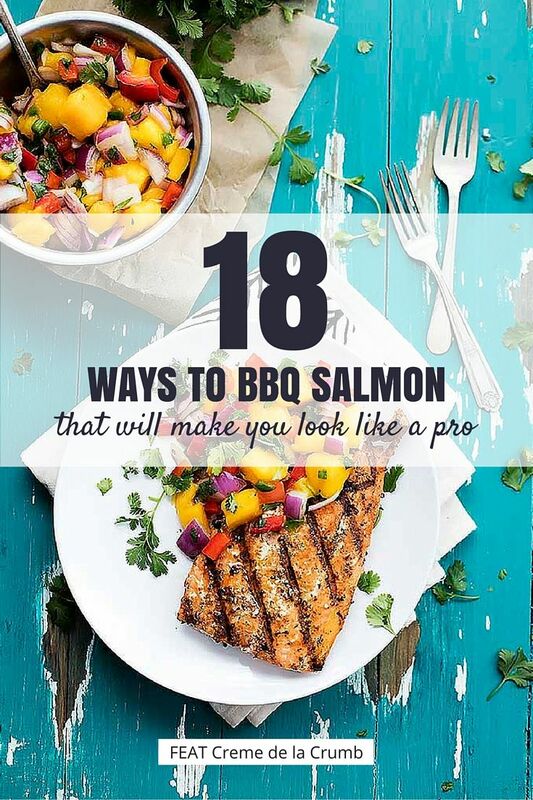 Try any of the 18 barbecue salmon recipes below and they’ll make you look like a grilling pro, while keeping prep and clean-up super easy. You’ll learn all you need to know about grilling on a cedar plank with this recipe. You’ll need to soak your plank for a few hours before grilling, but it’s well worth it – so delicious. 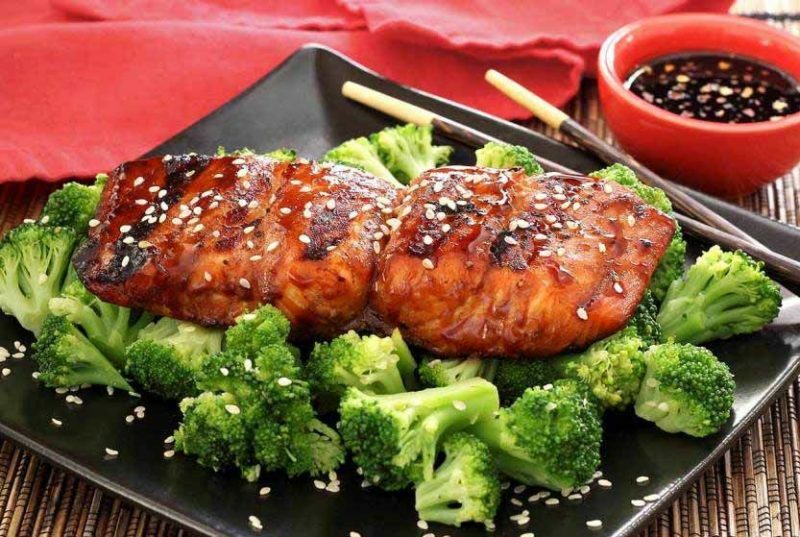 Chili, fish sauce, ginger, sesame oil, and lime impart Thai flavors to a grilled fillet of salmon. Serve with a large green salad or on a bed of sautéed bok choy for a summer meal you’ll feel good about eating. Kick off your outdoor grilling with winning recipe. There’s nothing quite like fresh salmon hot off the grill – and this easy recipe is made even better with a tasty sweet and savory marinade. Sometimes there’s nothing like a simple marinade to make a meal succulent, and this one – containing ginger, honey, Tamari, chilies and cilantro – is definitely a keeper. You’ll love these zesty, citrus-kissed skewers. 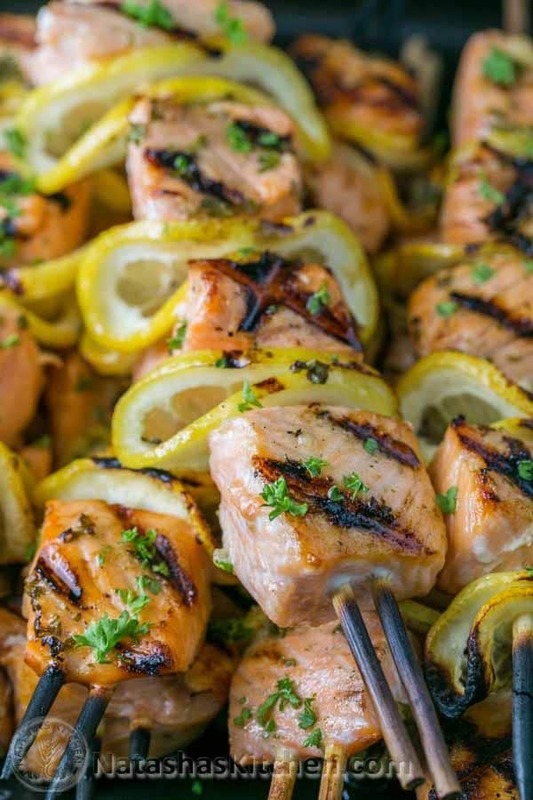 Succulent chunks of salmon are skewered with crispy, candy-like lemon slices. To keep the salmon from falling off or spinning, use double skewers for your kabobs. This simple recipe creates both a clean-eating and paleo-friendly dish. 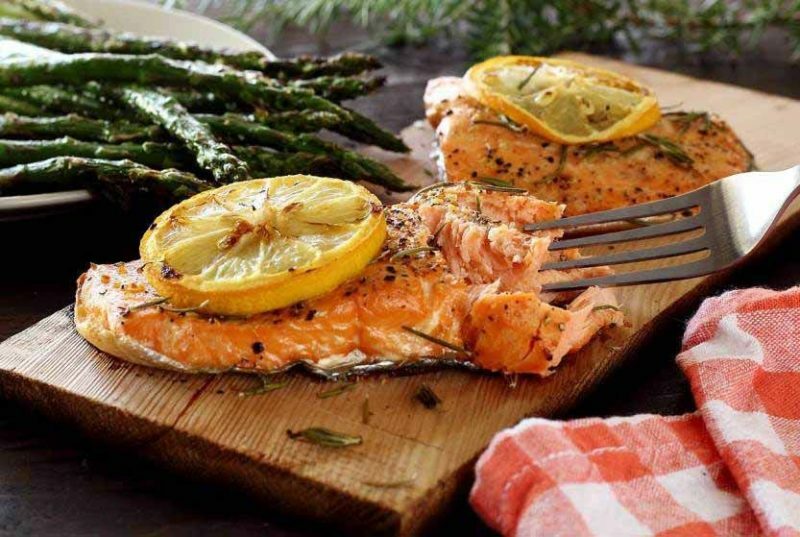 A water-soaked cedar plank infuses woodsy tones to the salmon as it grills. Super easy to prepare and clean up, you’ll love this flavorful dish! Summer peaches aren’t just for pie. Place halved peaches on the grill for a whole new take on salsa. This one will become a summer favorite. Need a speedy summer recipe that’s healthy and delicious? This one is a must-try. 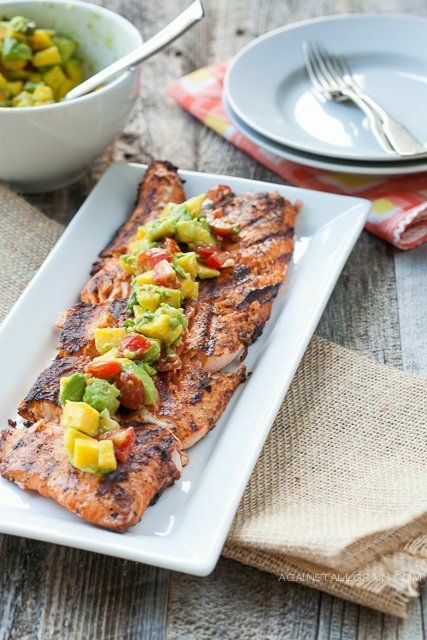 Spice-rubbed salmon is grilled and served on a bed of tomato and avocado salsa. Look for fresh heirloom tomatoes at your local farmer’s market to make this recipe truly amazing. Cooking for a crowd? Grab a large piece of wild salmon, rub on some blackened spice mix, and get grilling! This is an easy way to entertain – and earn rave reviews. Punch up the flavor of grilled salmon with a sweet-and-savory raspberry marinade. Your taste buds will thank you for the bright, zesty flavors in this easy-to-prepare meal! Looking for a meal with a tropical twist? 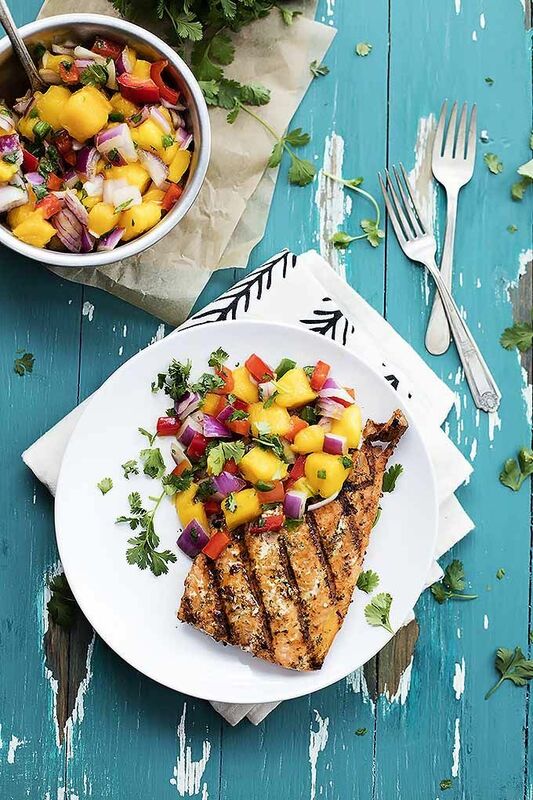 Pair the simple savory-spiced salmon with a sweet, zesty, vibrant salsa for an incredible dinner full of healthy ingredients. Need a go-to marinade? This is it! Lemon, basil, and oregano add elegant flavor to this marinade, which is great for veggies and any other meat too. There’s something magical about this recipe, that will have you making it again and again. Serve it on a bed of citrus Asian slaw for a flavor pairing that’s simply spectacular. Give your salmon Southwestern flair: Cumin, paprika, and chili powder lend spicy flavor to salmon fillets that are smothered in a deliciously creamy avocado sauce. You’ll get anti-inflammatory omega 3’s and heart-healthy monounsaturated fats all in one bite. Scrumptious, nutty, and sweet, this is a dinner treat. Maple syrup, apple cider vinegar, pecans, and spices top this paleo, gluten-free, dairy-free meal. 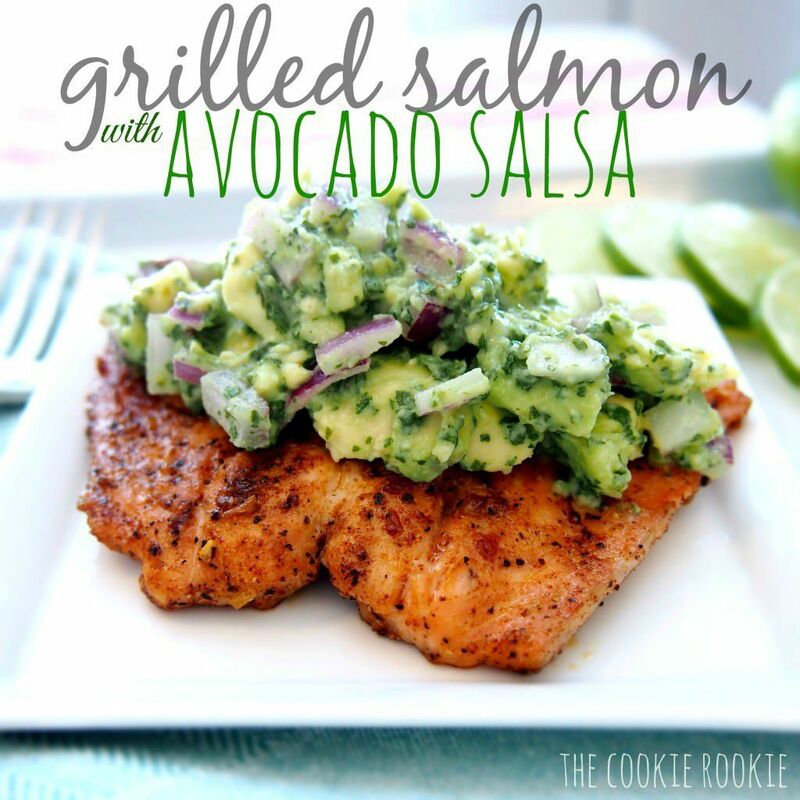 This grilled salmon and avocado salad recipe is easy to make, refreshing and filling, with an amazing spicy cumin-lime-cilantro dressing. This Whole30-approved recipe is easy, delicious and so good for you. This easy meal fits in perfectly with your healthy lifestyle. This quick and easy recipe is what clean eating should look like. The sauce is packed with high-powered nutrition that your body will love. 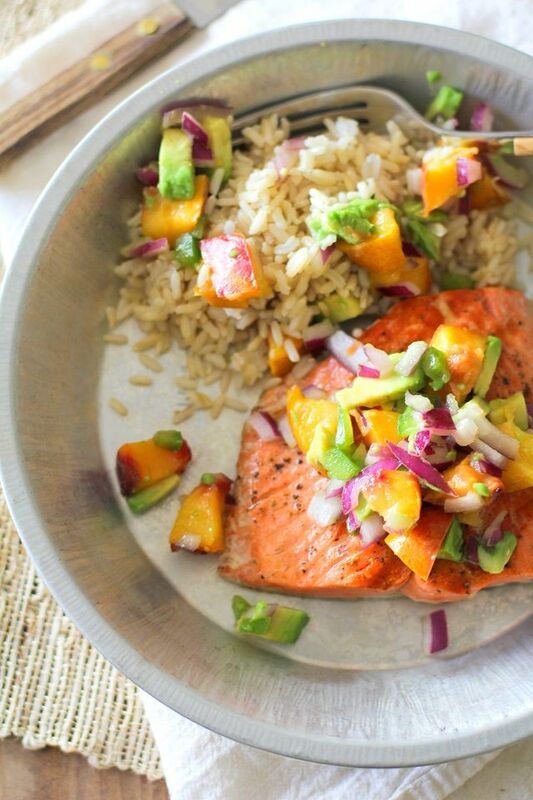 Marinades, rubs, salsa all bring out the best flavors in salmon in the incredible recipes above. Try any of the 18 delicious salmon recipes we’ve rounded up to ensure you’re getting your intake of omega 3’s while enjoying a delicious dinner. Fast, easy, healthy, and nutritious – the 67 allergen-free meals in the All Day Energy Diet Community Cookbook will have you serving a delicious meal within 15 minutes! And best yet: you can get the cookbook FREE right now by clicking the banner below.